May 17—Kodak’s Document Imaging business announces a powerful new document management solution for users of APPLE MACINTOSH Computers that makes it easy to organise, manage, and share digital files and scanned documents. The KODAK SCANMATE i940 Scanner for MACINTOSH Computers features precision capture for increased image accuracy, robust paper handling for greater process efficiency, and bundled software applications that enable greater user productivity. “The award-winning i940 has a proven track record of pushing the performance limits for a portable document scanner,” said Hauke Fast, EAMER Product Marketing Manager for Kodak Document Imaging. 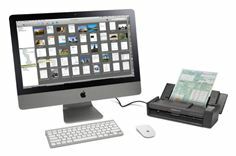 “Kodak’s new scanner’s advanced imaging capabilities help APPLE Product Users to enhance document management for personal or business tasks,” said Fast. Kodak worked with NewSoft to specially integrate Kodak’s Perfect Page technology and NEWSOFT PRESTO! PAGEMANAGER 9 Software for the SCANMATE i940 for MAC. This combination results in high-quality images that users can easily and quickly locate, access, edit, annotate, organise and share from the software’s easy-to-navigate interface. It also provides optical character recognition (OCR) and an all-in-one PageViewer. Another timesaving function of the application is the document pallet, which allows a user to rapidly convert files to searchable PDF, email the document or send it to a printer. The integration delivers productive functionality from Kodak including the simultaneous creation of colour and black-and-white versions of documents in duplex. Other advanced imaging features help to correct and improve document quality including auto-cropping, de-skew, image rotation, and automatic adjustment of brightness and contrast. Sharing documents scanned with the SCANMATE i940 for MAC is made easy with connectivity via PAGEMANAGER 9 Software to networked folders and cloud systems GOOGLE Docs and EVERNOTE. User productivity is maximized with customizable scan buttons within the PAGEMANAGER Application that provide shortcuts to favourite files and applications. The SCANMATE i940 for MAC also includes NEWSOFT PRESTO! BIZCARD XPRESS Software for managing contact information scanned from business cards. With a recommended daily volume of up to 500 pages per day, the SCANMATE i940 for MAC can hold up to 20 documents at a time from its automatic document feeder (ADF). The scanner, when AC-powered, captures images from documents at 20 pages per minute (ppm) or 40 images per minute (ipm) in double sided scanning at 200 dots per inch (dpi) in black and white or grayscale and up to 15 ppm or 30 ipm at 200 dpi in colour. Its USB-power option enables imaging at up to 8 ppm at 200 dpi. The ADF can also handle a variety of small documents from DIN-A4 to business cards, as well as identification cards, insurance cards and embossed hard cards. The SCANMATE i940 Scanner for MAC is available immediately and has a list price of 440 Euros including a limited warranty, which includes advanced unit replacement coverage for three years, in selected countries. KODAK Service and Support delivers a replacement scanner on the next business day and provides both packing materials and pre-paid return shipping. To learn more about the KODAK SCANMATE i940 Scanner for MAC, please visit www.kodak.com/go/i940forMac. For more information, please visit kodak.com/go/docimaging. Follow us on Twitter at twitter.com/kodakdi.